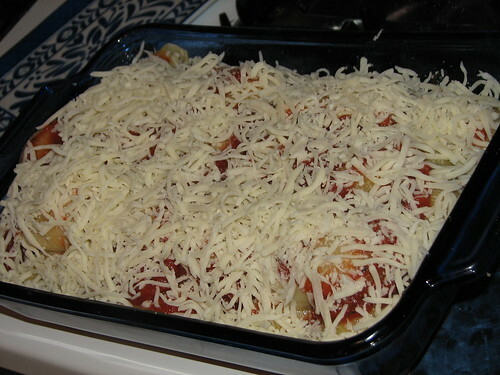 Dinner tonight was Stuffed Shells Florentine. We’ve had this before and it’s really good. 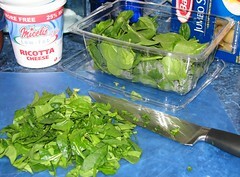 While the water heats for the pasta, prepare your ingredients. Preheat the oven to 375*. 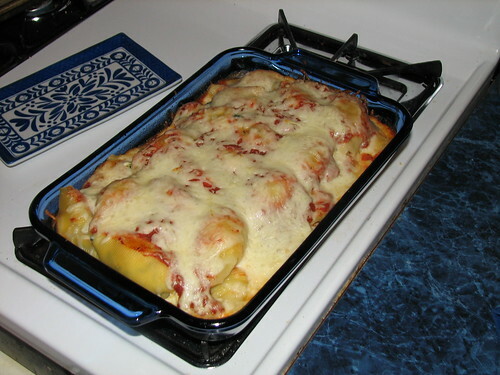 Grease a 9×13 baking dish. 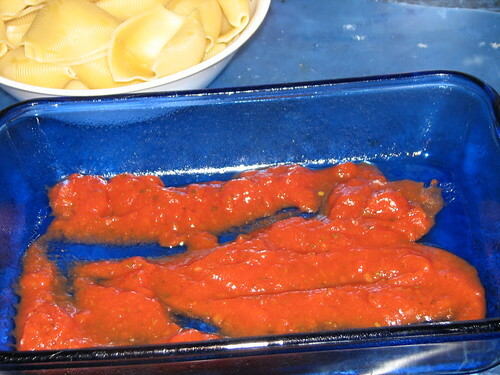 Spread a bit of sauce in the bottom of the pan. 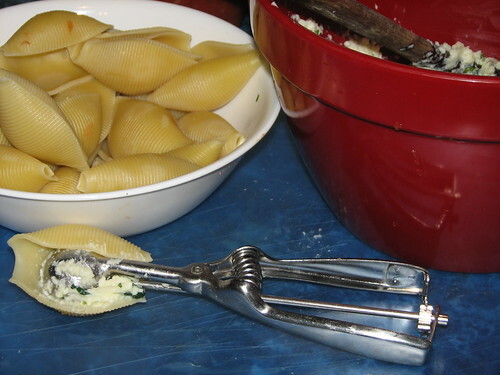 Cook the pasta until al dente. It will continue to cook in the oven, so don’t cook it too soft at this stage. Drain. 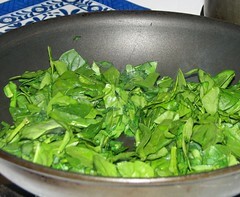 While the pasta cooks, give the spinach a rough chop, toss it into a skillet and heat it for a few minutes, stirring a few times. No need to add oil. 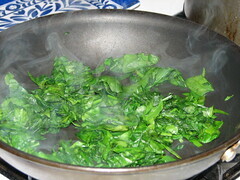 The water in the spinach will steam it. Don’t take it down to a total wilt. A few minutes of tossing in the skillet will do it. Remove from heat. 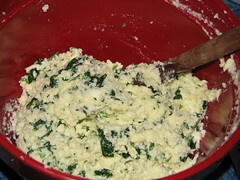 Mix the ricotta and the eggs until smooth. 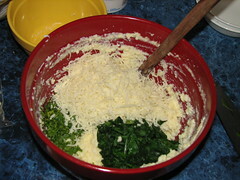 Add the Parmesan, spinach, parsley, salt, and 1 1/2 c. shredded mozzarella cheese. Stir till well mixed. 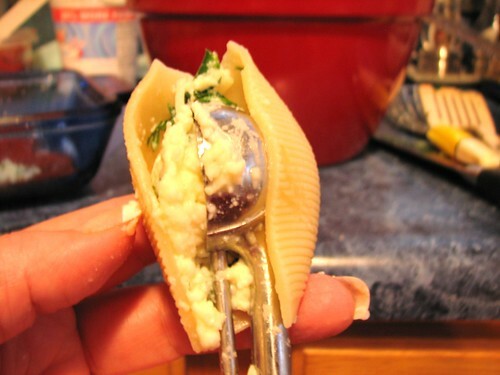 Stuff the shells. I use a small scoop and overfill it slightly. Perfect size. Put the shells in the 9×13 pan. My pan was a touch smaller, so I layered the extra shells on top. Worked just fine. If making two layers, spread a bit of sauce between the layers. 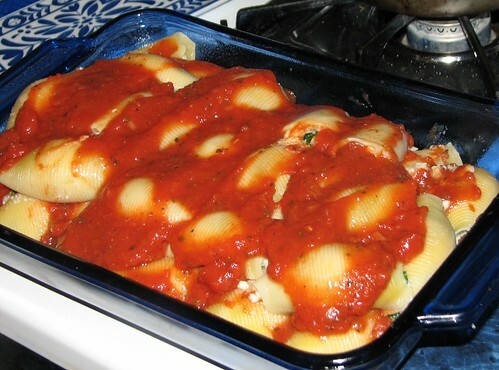 When all the shells are stuffed and in the pan, pour the rest of the sauce on top. Top the sauce with the remaining mozzarella cheese. Cover loosely with foil, and bake at 375* for 30 minutes. 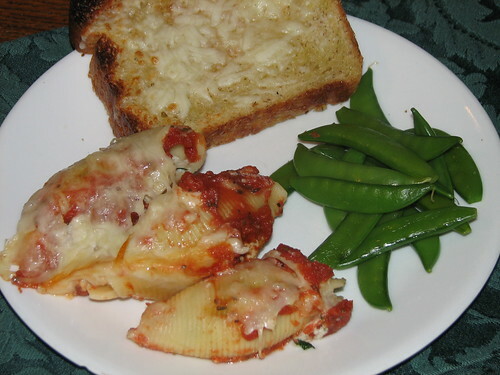 I served it with steamed sugar snap peas and toasted homemade bread, topped with a drizzle of olive oil, sprinkled with mozzarella cheese and broiled until the cheese melted. 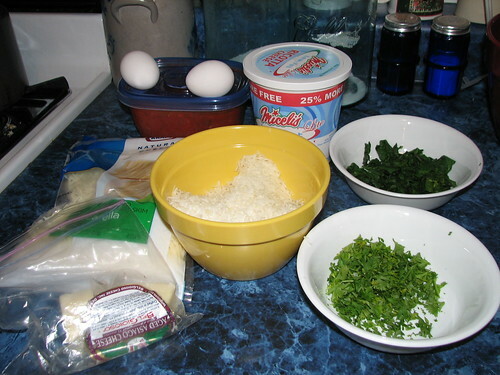 This entry was written by ~~Rhonda, posted on January 21, 2010 at 11:10 pm, filed under Recipes and tagged cooking, pasta, recipe, stuffed shells florentine. Bookmark the permalink. Follow any comments here with the RSS feed for this post. Post a comment or leave a trackback: Trackback URL. I want to eat at your house instead of at mine, or in my car thanks to Ronald McD. Getting ready to make this exact meal. Praying it turns out as good as yours looks.